The polished aluminum mirror sheet alloy 3003 are recognized by consumers in the market, and the reason why it has extensively application has a very obvious relationship with its unique advantages. Mirror aluminum sheets can be seen in some make-up brands or in interior decoration. So what are the unique advantages does the polished aluminum mirror sheet alloy 3003 have? Here, we find three reasons. First, the mirror aluminum sheet has very good reflective effect, what’s more it is not easy to be broken. The most important thing is that aluminum mirror sheet is easy to process and can be quickly processed into various products. Because of its reflective properties, aluminum mirror sheet 3003 has a good effect on some make-up brands and nameplates, and can attract customers’ attention in the first time. The application in the interior decoration can enhance the sense of space and give people a broad and bright feeling. 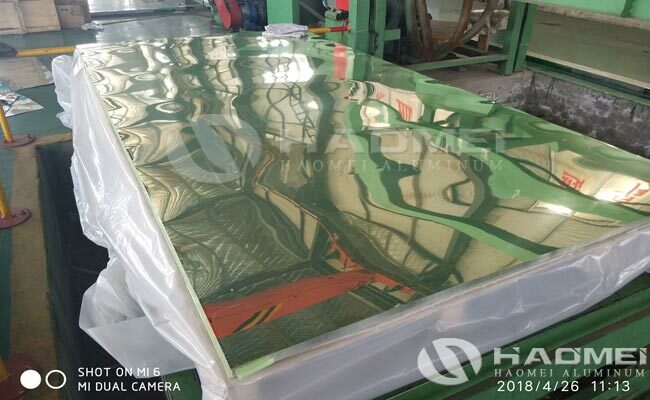 Secondly, the polished aluminum mirror sheet is very light in weight. Its weight is only one-third of that of stainless steel. Its light weight makes it more popular among processing companies, so that it can be processed into various products and put into the market. Third, the mirror polished aluminum sheet 3003 has good corrosion resistance. In the process, the material is very susceptible to external factors, and the material will be corroded with time, thereby affecting the appearance and use effect. Therefore, it is very important to choose material. In order to avoid corrosion, the polished aluminum mirror sheet alloy 3003 is very suitable for people to use.